We’re starting to see a troubling trend emerging in rock ‘n’ roll not quite two full years into its existence, as successful acts that had shown startling originality to begin with are now falling into the trap of looking to cover recent noisemakers in an attempt to latch onto their popularity. This of course was a common trait in pop music during this era as virtually every major star was busy swiping each other’s records for their own, all battling to have the definitive version in the marketplace, but now rock vocal groups in particular were starting to do the same. Not only that but the songs they were grabbing were coming more and more from the pop field thereby blurring the line between the genres just as rock was in the process of making its greatest gains to date. If ever there was cause for concern that the powers that be might successfully tone down rock to conform to established rules of musical decorum, this was surely it. I suppose it’s only natural this would occur sooner rather than later. Without much of a track record to go on in terms of consistent sales with rock music the independent record labels putting this stuff out were still going to be inclined to take their cues as to how to successfully run their operations from the biggest players in the field, namely the major companies who made instant cover records a cornerstone of their tactics. There’s also something else to consider which won’t fully come to a head for another decade or so but is already starting to show signs of being a problem and that’s how rock artists would become increasingly reliant on original material to establish their credentials to audiences. This stands to reason considering that the established Tin Pin Alley and Hollywood songwriters the pop stars got material from were hardly qualified to write raunchier and rhythmically aggressive tunes for rock acts to draw from, nor were those professional songsmiths inclined to want to stoop to such lows, even to draw a paycheck and put food on their tables. That meant – as it did with almost all forms of black music – that artists were left to come up with their own material to suit their audiences tastes. Rock had been doing this from the very start as Roy Brown, Amos Milburn, Andrew Tibbs and most of the saxophonists tearing up the charts had made their names initially by offering up material whose originality was such that it stood out in comparison to the majority of records in other fields. But vocal groups were not always so discerning when it came to creativity. For one thing black vocal groups had made significant inroads into the pop world prior to rock’s emergence as The Ink Spots and others had shown they could appeal to white audiences by adhering to the milder standards that field required. So while the first rock vocal groups had upended that approach by emphasizing rather than downplaying their soulfulness and ethnicity, their success with that more authentic style didn’t convince them this was the way to go, but rather it suggested they could score even bigger if they just moved further towards the mainstream. After all they figured if they’d already done so well with songs that had little or no appeal to white audiences then by aiming more directly at them they’d do even better, keeping their black fans while adding a significant number of white ears as well. The serpent offering up these apples had already gotten The Ravens to bite into it more times than we’d like to see and The Orioles, their greatest rivals in the rock field, weren’t far behind in that regard, with A Kiss And A Rose being their second straight cover song of an existing hit. If there was reason for optimism amidst the darkening clouds on the horizon with this unsettling trend it was that both The Ravens and Orioles weren’t necessarily looking to white pop acts for their cover material. The Ravens had just copped The Four Tunes decidedly rock leaning Careless Love for their own rendition last month and The Orioles had recently taken I Challenge Your Kiss from The Four Jacks, another black group, albeit a pop oriented act. But while that may alleviate some of the onerous implications of all this, it doesn’t absolve either group from their obvious intentions which was to lure in pop inclined listeners (black OR white) with these songs that hoped to straddle the genre fence. 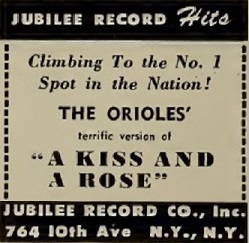 The record in question with The Orioles this time around is A Kiss And A Rose, a song that was currently riding high for The Charioteers, a group we’ve mentioned here in passing before but haven’t really gotten a chance to delve into until now. The Charioteers were one of those black vocal groups who’d found success in the pre-rock 1940’s by melding the lighter aspects of their cultural backgrounds with the dominant Caucasian attributes expected of most aspiring acts of the day. Formed in 1930 they began with spiritual songs but quickly moved into pop and with lead tenor Billy Williams they had a tremendous voice as their featured attraction. His light airy tone was delicately expressive but as required for those who were seeking broader acceptance at the time his phrasing was decidedly white-bread, as were the musical arrangements their records were couched in. 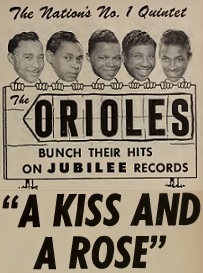 Though their version of A Kiss And A Rose would be their one and only hit they were incredibly popular on radio thanks to their appearing regularly with Bing Crosby on his program as well as backing Frank Sinatra on record (particularly winning is their take on the gospel standard Jesus Is A Rock In A Weary Land in which Sinatra gives one of his most moving vocal performances and is matched note for note by The Charioteers). The group’s stature in the music world was evident by the fact they were recording for Columbia Records after previously cutting for Decca, two of the established major labels. While they’d cut songs that touched upon a wide array of styles, including some early hints at the roots of rock, they were too old, their reputation too well-established and they were far too successful in their toned down style to dream of making the transition to rock like another pop-based vocal group The Four Tunes had flirted with at times. In fact their own version of A Kiss And A Rose had itself been lifted from The Ink Spots take on it from earlier in the year, showing how indebted all black vocal groups were to those pioneers. That includes The Orioles who were proving to be incredibly frustrating for those coming of age during this era who wanted something entirely new, not merely slightly modified renditions of the work by older groups. Yet when faced with the choice of hearing a new rendition of an admittedly very good song or going back months for yet another spin of their hits that had presumably been played to death already the decision was an easier one to make. Though we may criticize their choices when it comes to material and certainly have every right to feel slighted by their constant efforts at “crossing over”, which implies that the adoration of the black community was somehow not good enough, we have to still acknowledge that for the most part, especially lately, they’d learned their lesson when it came to just how to deliver these songs in a way that can connect with those of us in the rock community. One listen to The Charioteers version of this (or the even more stilted Ink Spots original) and you’d have to be utterly deaf not to immediately sense the differences inherent in The Orioles rendition. The Ink Spots, to our ears at least, sing this in an almost humorously artificial manner… florid to the point of parody, thereby robbing it of any authenticity when it comes to the sentiments they’re trying to get across. The Charioteers managed to improve greatly on that by injecting theirs with a far more realistic delivery that didn’t come across as if they’d had too much starch put in their underwear but it was still pretty mild, especially in how the emotions were kept in check with the wistful melancholy approach that Williams employs. Sonny Til thankfully takes a different tact with The Orioles version of A Kiss And A Rose, with his deeper tone and the rougher textures of his voice which seem to be emphasized even more than usual here making a huge difference in how theirs will be perceived. In The Charioteers version Williams sounded as if he was looking back from a safe distance at the events that unfolded as his true love wound up marrying someone else, still broken-hearted by this but no longer so distraught that he was unable to cope with the loss. By contrast Sonny Til has never gotten over his anguish making The Orioles record a study in emotional torture. The pace of the two renditions is the same but The Orioles kick things off with a guitar, which gives this a different twist. They switch to the more traditional piano accompaniment soon enough but by that point you’re focused entirely on Til who comes in with ravaged intensity, his voice somewhat raw and his delivery full of breathy pauses and wavering tones. He’s fighting off the torment as best he can but it’s a losing battle. We don’t get the story particulars in any of the versions, why this girl who was true to the singers would be swayed by someone else, but it sounds nefarious whatever it was. When George Nelson’s baritone comes in for the bridge, as always merely repeating the previous stanza rather than delivering a different perspective entirely, it actually works well because he seems just as distraught as his buddy, throwing in an unexpected alteration of the last line to boot, further giving the impression that whoever wound up with this girl did so using underhanded means. With Alex Sharp floating atop them both in one of the better uses of his high tenor the song is pulled together with each aspect adding something meaningful to the arrangement, showing why when everything was clicking with The Orioles they were so hard to beat. Even if you take the simple lyrics as being far more ambiguous than I’m suggesting, the suffering behind the sentiments are as plain as day in A Kiss And A Rose and it’s The Orioles who bring them out the best. Til is beyond despondent when he utters At the wedding I know she cried, convinced in his heart of hearts that she was just as broken up over this as he was, leaving far more questions than answers but leaving listeners without any complaints. Well that’s not entirely true maybe, for there’s still the ongoing complaint as to why The Orioles whose original material from manager Deborah Chessler was so profoundly good are resorting more and more to outside sources for their songs. But when the song chosen is as solidly built as A Kiss And A Rose you’ll overlook the allegations that it was a transparent means to make headway with another constituency altogether and focus instead on the connection forged with the audience who’d already elevated them to stardom. Maybe they wouldn’t be so fortunate in the future if they kept trawling other artists and other genres for their material, and eventually doing so could render them little more than opportunistic scavengers, desperately seeking to cut in on the success of others rather than leading the pack with their own vision. So if you wanted to dock them an extra point for their lack of originality here I’d understand. In fact I almost did myself but I’ve been plenty harsh on them for far more egregious offenses than they show here and when something is done as effectively as this song it really does need to be recognized, if only to show why this group was held in such high regard. Any way you cut it A Kiss And A Rose still stands as one of their defining performances, obliterating the collection of other versions of this tune and even making The Charioteers hit more of a footnote in The Orioles story rather than serving as the pinnacle of their own stellar career. Songs have to come from somewhere I suppose and while this might not be the place they should keep shopping for future hits, it’ll do just fine for now. Leave a reply on "The Orioles: “A Kiss And A Rose”"